At the International Botanical Congress in St. Louis this month, a team of researchers presented genetic evidence that the most primitive living flowering plant is an obscure species called Amborella trichopoda. For botanists who want to study Amborella, there is only one place in the United States that can provide specimen material: the UCSC Arboretum. "It is due to the foresight of our founding director, Ray Collett, that we have this scientifically valuable species in our collection," noted Ron Enomoto, interim director of the Arboretum. The Amborella plants are currently in a research greenhouse and not available for public viewing, said Arboretum manager Brett Hall. Amborella, a small shrub with tiny greenish-yellow flowers and red fruit, grows in the wild only on the South Pacific island of New Caledonia. Virginia and Todd Keeler-Wolf traveled to New Caledonia in 1975 when they were students at UCSC and, with Collett's guidance, shipped back some samples of Amborella. The Keeler-Wolfs collected many other important specimens for the Arboretum on that trip, which also took them to Fiji and Papua New Guinea, Collett said. 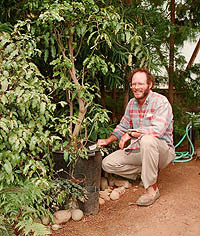 Collett recalled that it was a struggle to keep the Amborella plants alive at first. "They just did not want to live," he said. "I did everything I could to keep them alive for the first few months, and eventually they perked up." Word soon spread among botanists that the Arboretum had specimens of Amborella, and the Arboretum has been supplying samples to researchers throughout the world ever since, mostly without any compensation. Pamela and Douglas Soltis, botanists at Washington State University in Pullman who reported the new findings about Amborella's unique evolutionary position, said they and their collaborators have relied on the Arboretum and other botanical gardens for much of the plant material used in their research. For their most recent work, however, they used samples of Amborella collected in New Caledonia. "Botanical gardens have been absolutely critical to the timely completion of our projects," said Douglas Soltis. "Without botanical garden material, it would be very difficult for us to piece together the big picture of flowering plant relationships." Charles Darwin called the sudden appearance of flowering plants in the fossil record an "abominable mystery." This mystery persisted because of a dearth of fossil evidence, but researchers are now using molecular genetics to find new clues to the evolutionary history of flowering plants. The Soltises and their collaborators performed genetic analyses of more than 100 plant species in an effort to sort out the family tree of flowering plants. Their results indicate that Amborella belongs on the lowest branch of that tree as the first species still living to have evolved from an unknown common ancestor of all flowering plants. Previous studies had pegged magnolias or water lilies as the most primitive flowering plants. Amborella's primitive features include a lack of vessels for conducting water out of the ground and into its leaves. "It was known to have some very peculiar characteristics, and that's why we wanted to add it to the collection," Collett said. "At that time, people were beginning to see the potential for using molecular techniques to study plant evolution, and we knew it would be important to have living material for that type of research," he added. Hall said Amborella has done remarkably well here for a plant whose native habitat is a tropical rainforest comparable in climate to Hawaii. Last winter's severe freeze, however, killed many of the plants that had been propagated by Arboretum staff. "The ones that were outdoors were killed, so now they're all protected in a greenhouse," Hall said. Hall plans to propagate more Amborella and will eventually offer it for sale to the public. "It's a novelty item now because of its fame, so a lot of people may want Amborella in their parlors or gardens," he said. "It will probably take a couple of years, though, to build up enough stock to start selling the plants."